Safari Ltd. - Anker-Stone - AAI | Assael Associates, Inc.
ten that match in color, size and configuration. 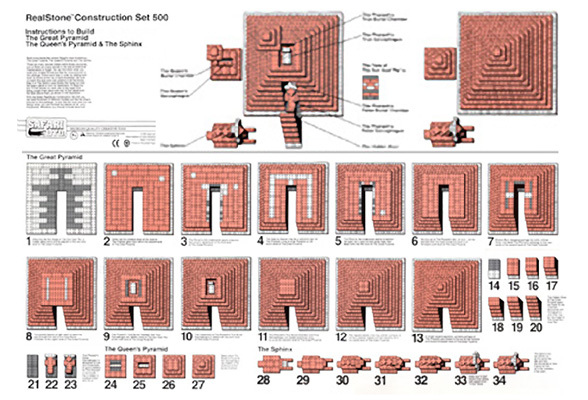 All 500 blocks in this set are used to build The Great Pyramid, The Queen’s Pyramid and The Sphinx. Product and Instructions tell a fanciful story of the mysteries and culture of Ancient Egypt. The Great Pyramid, The Queen’s Pyramid and The Sphinx. many secrets in the real architectural masterpieces of Egypt. You can find them when you build your models to look just like the ones pictured on the package. Follow each step in order by adding each layer as shown at the top of each illustration. Be sure to match the size, color and position of all the blocks. Step 6 of The Sphinx uses blocks that hang out over the layers below to form it’s headdress. with the “4 Dot” block from the layer above them, as shown in the illustration. when you use the best foundation of all…your imagination. Whatever you choose to build, have fun! within the foundation in the very first level of The Great Pyramid. glow from within the second level of The Great Pyramid. at the third level of The Great Pyramid. trying to enter paradise at the fourth level of The Great Pyramid. gives hope from deep within the fifth level of The Great Pyramid. the most mysterious level of all…the blank sixth level of The Great Pyramid. The Pharaoh’s passage to the next world at the seventh level of The Great Pyramid. of the False Burial Chamber at the eighth level of The Great Pyramid. close to The Sun God “Ra” at the ninth level of The Great Pyramid. is added with the tenth level of The Great Pyramid. and known only to us at the eleventh level of The Great Pyramid. of the heavens, form the twelfth level of The Great Pyramid. sits closest to the sun at the mystical and feared thirteenth level of The Great Pyramid. decorated with hieroglyphics and what may be the image of The Great Sun God “Ra”. of grave robbers, for The Pharaoh is not inside. He is hidden in a place known only to us. in the darkness of her Burial Chamber. 28.- 33. Keep four “2 Dot” blocks from falling with weight from “4 Dot” block. 34. The Sphinx has sat silently by as the centuries ebb and flow like the sands of time. It gives no hint as to the wonders it has seen. and the Empire State Building, and the Greek Parthenon here. The Queen’s Pyramid and The Sphinx on The Giza Plateau here.